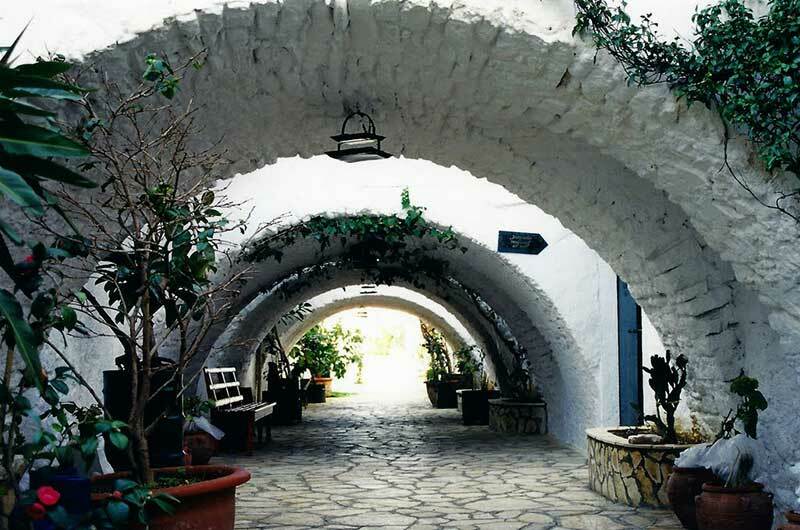 In the most beautiful part of northwest Corfu, 25 kilometres from the capital, stands the monastery of Yperagia Theotokos of Palaiokastritsa. It is a holy place, among the heaven and the earth. Because of the Ionian sea around it, the towers and the villages of Lakones, Krini, Makrades and Liapades, Palaiokastritsa is one of the most important places of spiritual and social content. The name Palaiokastritsa came after the wider region which was named Palaiokastro (Old Castle) and it is a proof of the existence of an old castle, where now the monastery was built. According to the Orthodox tradition, the monastery was established in 1228 by monk Efthimios Midas, originating from the village of Pagoi. In that place there was found a sacred icon of the Virgin Mary. However, there is also a written proof for the church in 1469. This is the notarial deed composed by Stamos Goulis and refers to the renovation and hagiography of the church. In the middle 20th century, the Temple was collegial and it belonged to the fraternity of villages’ builders who contributed to its establishment. The church was gradually transformed into a monastery. In 1658, when monk Gerasimos Flokalis became abbot, is a very important chronology, because from that moment on the church is called “monastery”. The fraternity of the village started existing in the middle of 20th century. When Prokopios Doikas (1916-1952) was the abbot, the old regime changed and after a royal decree in 1940, the monastery was recognised as independent and part of the Administration of Metropolis of Corfu and Paxoi. Because of its location but also because of the strict rules in the beginning of 19th cetury, the monastery was a place for isolation for the priests of Corfu and Greece in general, who had violated the rules. Apart from the priests, other people went there to find their inner peace. Some of them are Edward Lear, Luis Golding and Arthur Foss. The building complex of the monastery consists of many places fully renovated (Temple, archontariki, Museum, Cells, Kitchens and so on). The one-aisled Basilica Temple is simple, without any particular characteristics but full of invaluable sacred images and utensils. The iconostasio (temple) is made out of stone and two shrines with the sacred images of Virgin Mary and Saint Nikolaos, the urania (ceiling) has hagiographies of 1922, two smaller shrines in the entrance. THese are some of the artful treasures of the church. In one of these two smaller shrines, there is the sacred image of the Dormition of Virgin Mary created by Emmanouil Lambardos (16th-17th century). In the walls there are four great images made out of wood and gold-plated frames and indicating All Saints of Chrisoloras (18th century), the Second Coming and two scenes of the Genesis by Foskalis, in 1713. There is also an image of the Three Hierarchs (second half of the 17th century) and a sacred image of Virgin Mary placed in the Despotical Throne painted in 1914. There are also many holy reliquancies. In front of the north gate of the Temple there is the Bell Tower, built in traditional corfiot style, and right above it there is a well, which nowadays has become the “well of the wishes” for visitors, who also throw their coins to support the renovation and maintainance of the temple as well as some other activities that the monastery does (pubications. giving money to students and so on). Since 1989, the monastery with the abbotship of the Archimandrite Eftimios Douis, has organized a museum of metabyzantine images, holy vestments, gold-embroidered, holy jewels, crosses, Gospels etc. Also in the museum, there are also some bones of a sea whale. Equally important is the library of the monastery which has 39 manuscripts that date back to the 11th and 12th century, 419 printed matters(since 1900) and many recent publishings. Metochia (dependencies) of the monastery are the churches of Saint Spyridon in the beggining of the road to the Monastery and the one of Prophet Elias in Lakones. The Holy Monastery of Palaiokastritsa celebrates twice a year. On the 15th of August, in the feast of the Dormition of Virgin Mary, and the Bright Friday (the first Friday after Easter), in the feast the Zoodochos Pege (the Spring of Life). The second festivity is associated with the litany of Potamos that took place the Bright Monday and returned in the church the Bright Friday after Easter. The other litany finished in the monastery of Korakiana and was taking place twice a year, the fifth week of Lent and the Bright Tuesday. Bishop of Corfu, Mr. Nektarios: “Zaccheus had Christ in his heart”.